Confined Space Cleaning | FCS, Inc. Confined space cleaning is a specialized service for industrial production tanks, vessels, and silos of all shapes and types. 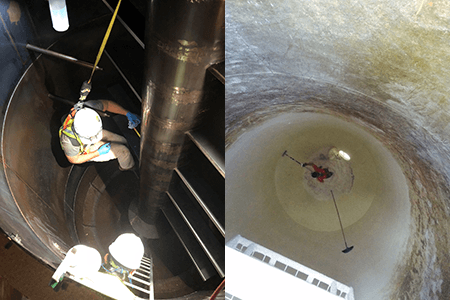 FCS, Inc. confined space entry teams can safely enter these highly enclosed, regulated structures, perform silo cleaning and maintenance, and restore the tank to useful service. Safety is our first and most important focus at FCS, Inc. Our confined space entry team consists of active duty firemen who maintain several certifications required for OSHA’s requirements for permit-required confined space access. The biggest advantages to contracting your silo and confined space cleaning is safety and certified entrants. FCS, Inc. teams take special pride in safely entering confined spaces, completing the assigned cleaning or maintenance task, and exceeding expectations quickly. OSHA regulates individuals who enter confined space. A confined space is not typically designed for continuous occupancy by individuals. The confined space has limited or restricted means for entry or exit. It includes, but is not limited to, tanks, vessels, silos, storage bins, hoppers, vaults, pits, manholes, tunnels, equipment housings, ductwork, and pipelines. Contains a material that has the potential to engulf an entrant. FCS’ equipment is approved for confined space use. This includes, but is not limited to, explosion proof lighting, explosion proof vacuums, respirators, repelling systems, and tripods. Tools suitable for the appropriate cleaning mission are also available. Working in a confined space requires team supervision. An FCS safety supervisor will remain on site to oversee all work and to ensure that all tasks are performed safely and efficiently. Detailed work reports, including images and video, are provided for auditing purposes when requested prior to the commencement of work.